When we set out to intentionally build relationships with other people—especially non-family members—expect pain. I tugged the sheet over the corner of the guestroom bed and thought for the thirtieth time about the odd-sized mattress. None of my sheets fit its contours correctly. A tear dripped off my nose onto the clean sheet. “Dumb kids,” I thought, as I held the sheet in place with one hand and reached for a tissue with the other. I knew I didn’t mean it. The circumstances of changing the sheets and cleaning up the room after a long-term guest brought back memories of another kid who had done dumb things. My own. This time, the kid didn’t belong to me. But, for five months he had lived in our home, gone on vacation with us, played Catan, and shared life with us. I thought we had built a solid relationship. A relationship that would give him stability in his life so he could make better choices. Evidently not. He broke his contract and tough love required that he return home. Boy, did it hurt. Not because I felt betrayed, but because the dreams I’d built for him vanished like a cloud castle in a windstorm. Stretching the sheets over an odd-sized mattress reminded me of our daughter, and the troubles she experienced as an adolescent. I methodically picked up the detritus left behind by an adolescent boy and thought of what our daughter left behind. Fried pigs’ ears under the bed (and she’d never eaten pork before). Paintings, journals, and sketches that showed her inner agony. Each item a clue. But I’d known her for 20 years. I’donly known the boy for a year and a half. The boy left his textbook and library book (evidence of responsibility? ), his tie and belt, but he remembered his dress shoes. He took the game of Risk we gave him for Christmas (does that mean he doesn’t hate us?). I set aside my analysis, it tortures rather than comforts. I pushed the vacuum back and forth over the carpet, my mind bouncing questions in rhythm to the hum of the motor. Why build relationships with others? Do the rewards of relationship outweigh the risk? We took the young man in because we felt God’s call to open our home. Had God forgotten? Or had we failed God? The room set to rights again, I sought comfort in my office and my Bible. Somewhere, someone said something about weariness. I used my Bible app to find the verse. Second Peter 3:9 pops up. I realized I got it wrong. I sighed. Once again, I realized I can’t rush God. I have to trust that he is building something in the boy. I only played a small part. When we build God-led relationships, we can’t hurry the process. I do the only thing available to me. I pray. God will work things out in his time. After all, it happened with our daughter. Sorry you had to go through this, Anita. I am at the other end, encouraging Barbara to build new friendships and start distancing herself from my eventual death. It’s necessary but it is hard. Aww. Thank you for your empathy, Andrew! Anita Ojeda recently posted…Are You Confident that Your Seeds Will Grow? Anita, I know what you mean. We’ve had many exchange students in our home. Most worked out just fine but one was just not meant to be. We’ve recently had a young man living with us for about 1 1/2 yrs. There were ups and downs, but even now that he has moved out our relationship is good. We chat every now and then and I make sure to check on him and pray. But it is risky to begin relationships not knowing how they will be. Even so, we can trust God to work in His timing though it may seem slow to us. Blessings to you! That’s so cool that you open your home–I think I got that gene from my parents–who had a host of exchange students and waifs over the years. For years my main relationship was with my job. Too many years. Last year the job changed. I find myself wanting to build relationships with people now and writing is one way to do that. Yes, it seems risky through the computer screen and face-to-face, but not stepping out shouldn’t be a option. A lovely post. Thanks. I’m so glad you’re on a journey to build relationships, Suzette! Blessings as you seek friendships and community with other people. Relationships are so hard. Sometimes the pain makes me want to pull away, with my own family and certainly with friendships. 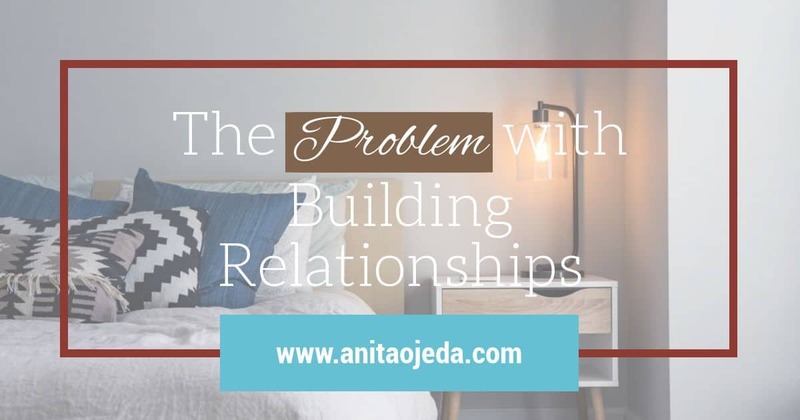 I’ve found it so hard to build relationships strong enough to survive serious conflict. Instead I let relationships die a slow death because I’m afraid to have to hard discussions. God rarely works at my speed, I’m having to accept his slow process of growth in development, in myself and in others. Thank you for sharing this. Oh, I know all about the slow death routine :/. I’ve been guilty of that many times…wait, I’m STILL guilty of that. I definitely tend to build walls – with much more ease and frequency – that build relationships. No doubt, to protect from the hurt. From the yuck. But God is helping me not only to take down some walls but how to invite others into my space – my safe zone. It is a challenge – and a slow change – but I see Him working. May God be with you on your journey to building relationships instead of walls! He is faithful and will help us each step of the way. God’s timing not ours indeed. I’m sorry you experienced this pain, Anita! It is hard when we give so much of ourselves and have hopes for people/ relationships and it doesn’t work out. I love the verses you share. It is encouraging to remember that God can use our work even if we don’t see the fruit at the time or in the way we expect. I don’t know what I’d do without the promises! So hard! There is nothing happy about this situation, and my heart hurts to know it happened. I pray every day for J and hope, hope, hope for a miracle. The miracle may be a long time coming…but I’m ok with God’s timing. You are experiencing exactly what keeps most of us from taking the risk of opening ourselves up to another. It’s especially hard I think when we are attempting to make a difference in a child’s life. I know it wasn’t easy for you to share this with us but know that your words have touched me. I know you touched the young man too! You know all the teacher feels, Cindy–I’m sure you’ve experienced situations like this many times! For years, my primary relationship was with my job. That left me with few close friends. I’m working to change that now and that’s why I love the blogging community. There is always someone with an encouraing word or helpful tip, like the key word search tool you shared today. Awesome! Thanks, Anita. Anita, your house and hospitality are a blessing to others. We can never grasp the ways that our obedience to God impacts others. It’s hard when we don’t see what we expected. But, as you mentioned, our time does not always coincide with God’s. I think that’s one of the things I look forward to most in heaven–telling people how much they’ve meant to me (I didn’t do enough of that as a youngster! ).